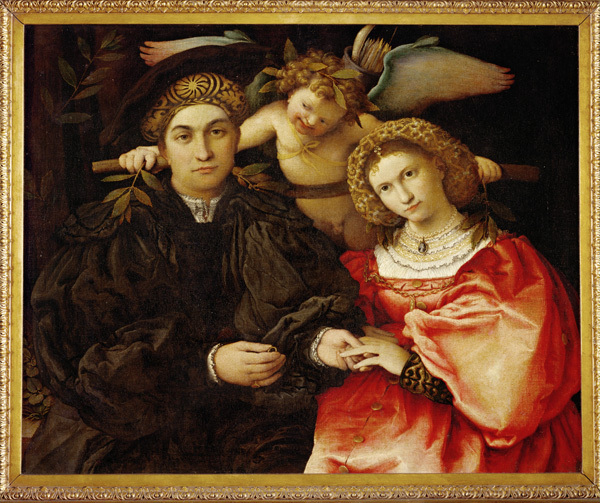 1) Lorenzo Lotto painted this marriage portrait of a couple from Bergamo, Marsilio Cassotti and Faustina Assonica, in 1523. The portrait uses Renaissance-era symbolism to express the goals and ideals of marriage in the sixteenth century. Bride and groom are wearing elegant and costly clothing to indicate their wealthy status. The bride wears several expensive pieces of jewelry, including a gold chain, draped over her shoulders, composed of many links, known as a “bond of love.” The concept of a happy union is conveyed in metaphorical terms by a smiling cupid (he is identified by the supply of arrows he carries in a basked strapped to his chest), who holds a yoke behind the couple and places a sprig of laurel—a symbol of virtue—on the shoulder of each. This portrait uses Renaissance symbolism to make a statement about a happy and propitious marriage. What kinds of imagery would a modern bridal couple choose to indicate their goals and expectations of marriage? 2) The divine winged horse Pegasus was used in the Renaissance as a symbol of wisdom and fame, and it was also associated with the muses. The animal appears on the reverse of this medal made for Cardinal Pietro Bembo. The medal’s obverse identifies Bembo by name and title. How does the imagery on the reverse communicate other aspects of his life and career?